Miller Restoration understands that when water invades your home, you need immediate action. On call 24/7/365, our certified restoration team will arrive promptly, assess the extent of your water damage in Newtown Square immediately and start water restoration right then and there. We have extensive experience servicing Newtown Square PA, whether you’ve discovered flooding from a broken or leaky pipe, damage from frozen pipes, a sink or toilet overflow, or a malfunctioning appliance like a water heater, washing machine, dishwasher or refrigerator in your home, or you’re a victim of basement water damage, our flood damage technicians are equipped to handle any problem of any size 24 hours, day or night. We are a water damage company servicing Newtown Square residents with residential and commercial water damage issues. If you are suffering from an emergency water damage situation, don’t hesitate, call Miller Restoration today at 610-688-2829. We can start your water damage repair immediately and get your life back on track. Newtown Square was the name used for the townstead with the majority of early settlers being Welshmen. These Welsh “Friends” (Quakers) needed a road to facilitate their journey to meeting, the only established road at the time being Newtown Street Road, which ran north and south. As such, in 1687, an east-west road was laid out (Goshen Road) so the Friends could attend either Goshen or Haverford Meeting. By 1696, these friends had become numerous enough to hold their own meeting in Newtown and continued to meet in a private home until the completion of the Newtown Friends Meetinghouse in 1711. In the 18th century, Newtown was basically a farming community. Blacksmith and wheelwright shops emerged on the main arteries to service horse and buggy travelers. Taverns and inns were also opened to accommodate local patrons as well as drovers taking their livestock to the markets. Today, Newtown Square is home to such attractions as Newtown-Edgmont Little League Fields. Providing services to Newtown Square PA, including 19073. 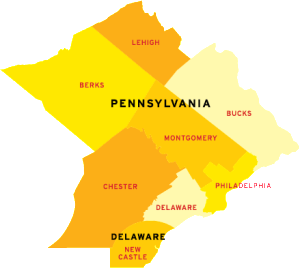 We also provide water services to areas such as Narberth PA and Fort Washington PA.